Very comfortable at Marina Village sale dock. No worries, WORKNOT is not for sale but we managed to get a great end tie from friend Phil Reynolds who is also a broker for Orange Coast Yachts. Full view of Jack London Square and further up the estuary. Managed to get a rental car for about $20/day from a local Alameda rental agency so we had wheels to help us visit with old friends and chase boat parts. We lived in Alameda on 3 different boats for about 7 years. Great to get back to "home" but also quickly got back into the daily race. Captured this moon rise from our bow with a large crane in the foreground. Watched the NCAA tournament with more than a passing interest as I'm a UK Wildcat alumni. Flew the flag but it didn't pull them over the line. Great couple of games and UK has little to be ashamed of. Notre Dame got in their head and they never recovered. Spring is in the air and this family of ducks hung at near us at Marina Village. After arriving in Alameda on 3-23-15 time finally came for us to head north. Planning to stop at Humbolt Bay we left our slip at about 5AM on a mild ebb current. Leaving SF bay in the dark was tense even with the number of years we boated here. Thanks to AIS we had a good handle on ship traffic and they could identify us. Got courtesy calls from two different inbound ships to arrange passage and confirm our intent. 5:48AM we cleared the north pillar of the Golden Gate "outbound for sea". Good weather allowed us to use the Bonita Channel short cut. Just finished reading an interesting book called "The Widow Wave"-Jay Jacobs. Its about a real life loss of a small fishing boat and crew in the Bonita Channel focused on the ensuing lawsuit. Good education of wave formation and the responsibility of being "Captain" no matter the size of the vessel. 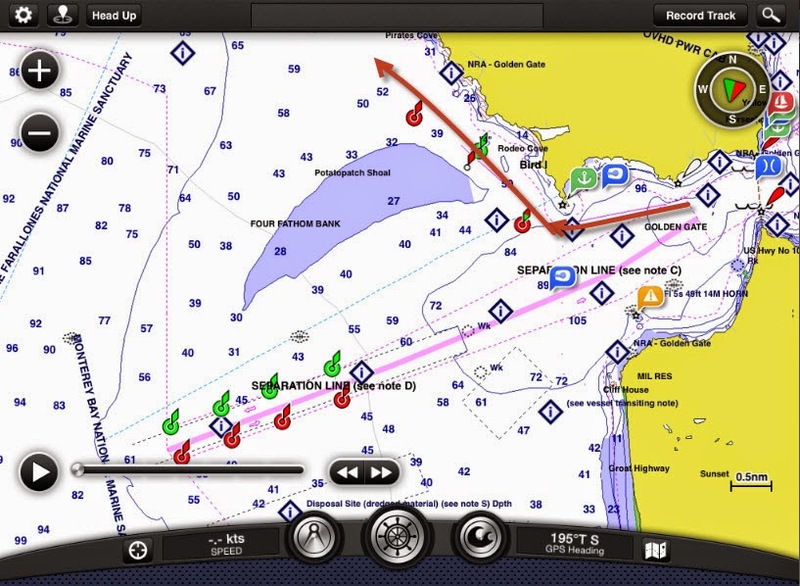 The trip up the coast was great, we have good seas, no fog and moderate winds. Mary and I traded watches without either of us feeling fatigued or short on sleep. Cleared the bar a Humbolt Bay just after noon on the following day. Slack water as we entered and then a slight flood tide. We were a little early but a check with the USCG station Humbolt Bay gave us a favorable bar report. No breaking waves at the bar and mild winds. This one was easy, hope the rest of our crossing go as well. Slip at Woodley Island Marina about 2 miles into the bay. Its a fishing town and the harbor reflects its rich heritage. This statue at the end of the island is huge. My guess is 30' tall. The setting is great and next to it is a memorial to fishermen lost over the years. Many of the names listed have a star next to the name indicating the body was never recovered. This area is called the lost coast due to the rugged nature of the shore. Development is spotty at best, harbors are along way apart and lots of reefs and rocks. WORKNOT doesn't look too out of place among the real trawlers. Across from the island Eureka's "Old Town" is accessible by dinghy. Lots of nice coffee shops, restaurants, book stores and marijuana growing/smoking hardware stores. Eureka has done a good job of making the "Old Town" area desirable. In one coffee shop this was in the tile floor of a restroom. It really is an "Old Town"...... From the gold rush to world class logging operations this area has been an economic boom and bust area since California was a territory. Many restored buildings and even a turn of the century carriage ride available. Weather does not look good for the next few days so hope to catch up on some boat maintenance and reading. Today it rained for a few hours and cooled off to the low 50's. Missing Mexico, shorts and sandy beaches but will continue the trek north. Love your blog. Read it from the beginning after I discovered it a couple of days ago. I think I picked up your blogsite from the Nordhavn Dreamers site ??? anyway, if you are turning left as you come up to the Columbia River and visit Portland, give me a shout out and I would be happy to buy some "refreshments" and chew toys for you all. Being a dreamer just recently starting along the path as I come close to retirement, would love to hear stories, pick your respective brains, etc. We have just returned from San Diego and Powerboat training as we begin our prep. Could also assist in getting to provisions if needed. Little typo there ... If you are turning right. Where's my compass? We continue to watch the weather but hopeful for Monday departure. Don't really have a firm plan but will keep your gracious invitation in mind. Good luck on your journey, ours has been very rewarding and we are just really getting started!